You have a simple directory website. You do not sell anything from it. Visitors have no opportunity to upload, download or otherwise interface with your pages, so you do not need extensive protection. You are simply providing directory information. It is possible that your information providers do post their data into your site and maybe interface with you in other ways. If so, this contract is not suitable for that relationship. See below for alternatives. For this document to work for you, you must set it up in some way that requires a visitor to click to accept these terms. If you cannot do that, your visitor is not bound. 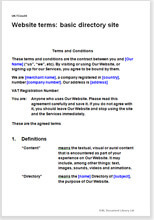 This is one of over 35 website T&C document templates sold by Net Lawman. There is none more suitable for a very simple directory site. If you want something more comprehensive, try our filter assisted collection at Website terms and conditions.